During awards season we get to see our fave celebs like Lupita, Cardi, Halle and Taraji light up the red carpet in glam designer gowns, shimmery jumpsuits and head-turning avant garde garb. We live for these moments of fashion inspiration, and this year there have been plenty of sartorial highlights. Have you been keeping score? Here are our picks for the most fab looks from this season’s major award show ceremonies. The Black Panther matriarch is dressed to reign in a gray, fringed Georges Chakra gown, Casadei shoes, a Tadashi Shoji clutch, and Kimberly McDonald jewelry. The Black-ish fashion plate is flirty in Fendi gown, Christian Louboutin heels, and Cartier jewelry. Fresh face BlacKkKlansman costar Laura Harrier is pretty in pink custom Loewe dress and Bulgari jewelry. This Is Us darling Susan Kelechi Watson is a ray of sunshine on the red carpet in a tiered, yellow Christian Siriano gown with a plunging V-neck. Wearing an eye-catching burgundy Zuhair Murad Couture gown with strategically placed sheer, lace and velvet panels, Halle Berry shows us why she’s the queen of the red carpet. Bow down. We’re green with envy over the Empire and What Men Want star in this custom plunging emerald velvet Vera Wang dress. The always stunning Westworld starlet is on a silver streak in a shimmery Michael Kors Collection gown, Aquazzura shoes and Jennifer Fisher and Niwaka jewels. 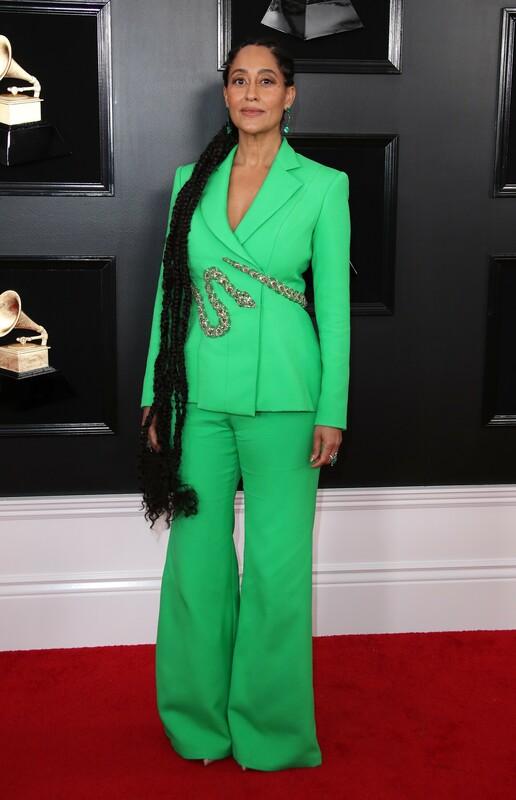 As host of the 61st annual Grammys, a cooly confident Alicia Keys made several wardrobe changes, including jumpsuits in red, black and green. But we were especially here for the custom Armani Privé crimson long-sleeve gown with buttons lining the center, plus Bulgari earrings, ring and necklace the star rocked on the red carpet. Cardi B. made history, becoming the first solo woman to win a Grammy for Best Rap Album. Part old Hollywood glamour and part futuristic fashionista, the Bronx rapper didn’t disappoint with her grand entrance in a vintage Thierry Mugler Couture outfit (from the 1995 collection) featuring a sheer bodysuit and black skirt that opens into a structural shell-like creation, accented by pearls around her waist, neck and beehive do. Like her mom, Diana “The Boss” Ross, Tracee Ellis Ross is a fashion leader — not a follower. And at the Grammys she commanded the spotlight in a bright green Ralph & Russo wide-leg suit with embroidered serpent belt. Isn’t she lovely? Jada Pinkett Smith stuns in a V-neck Roberto Cavalli Couture embroidered gown with feathery skirt and elaborate train. 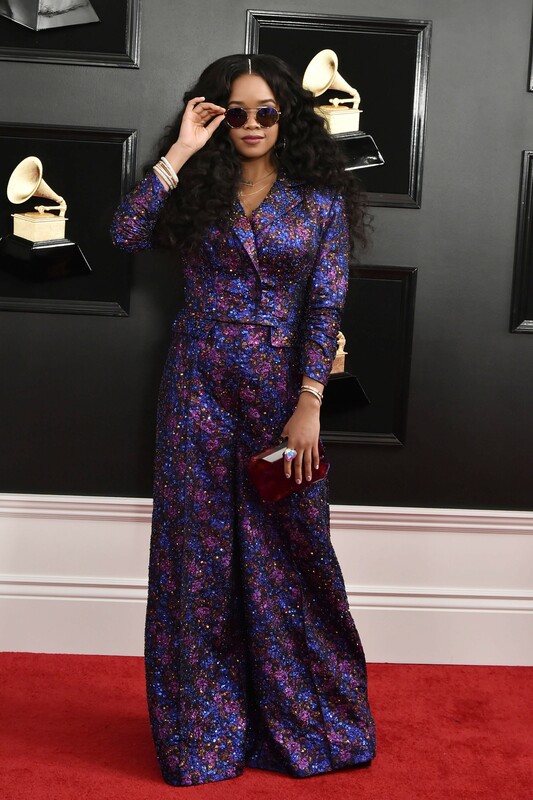 Best R&B Album winner H.E.R. (real name Gabi Wilson) has a sporty Boho chic vibe, and we love her in this purple custom Coach jumpsuit embroidered with crystals and paillettes, which she tops off with blue sunglasses and a maroon clutch. 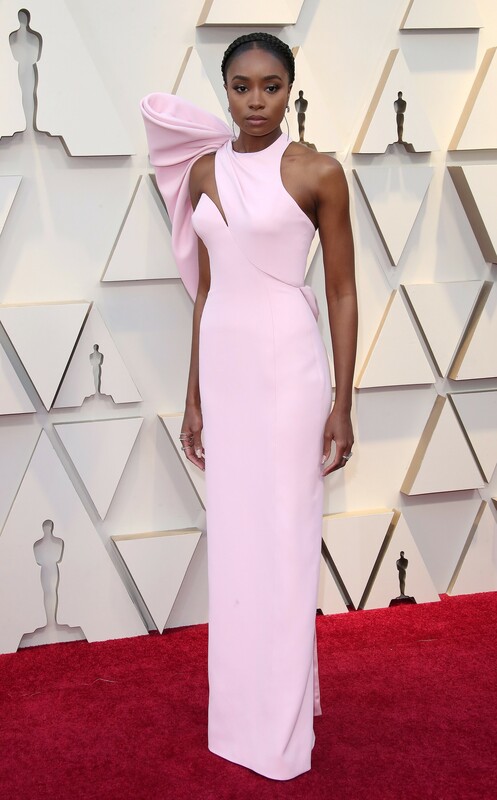 For her Oscars red carpet debut, the If Beale Street Could Talk ingenue channels old Hollywood glamour in a dramatic pink-bowed Atelier Versace gown with Atelier Swarovski jewels. 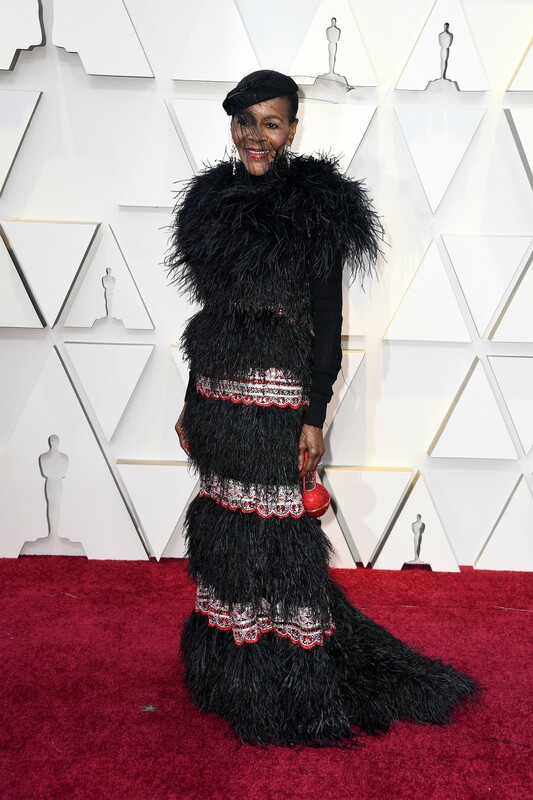 Legendary actress and former model Cicely Tyson looks au courant in a tiered and feathered B Michael gown. The stunning 94-year old became the first woman of color to receive an Honorary Academy Award.